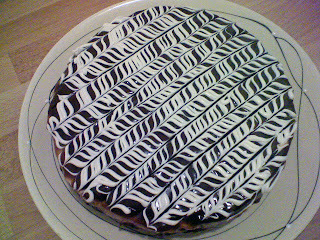 I made this durian cheesecake last night and topped it up with a rich layer of fudgy chocolate. 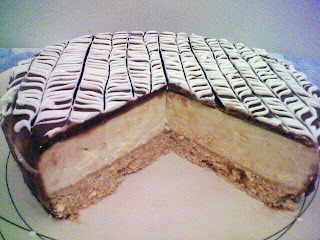 Leaving the durian cheesecake in the fridge overnight gives a better cheesecake setting, the durian infused right in THERE! Like, you could feel the durian and the cheese together and it makes you crave for more with every sinful bite. Pretty filling and considered heavy for an after meal dessert but overall, it was great and I was so glad everyone love it! Recipe courtesy of Ellena Mummy but i modified it a little to suit my own taste and the availability of ingredients in my kitchen. Give it a try if you wanna kill some time, pretty time consuming in my opinion. This is what you get when you combined 250g of sweet biscuits with 130g of butter.Press it down real hard and as even as possible and chill it for 30mins. 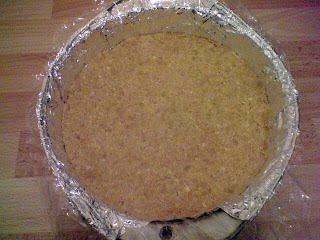 Definitely too little butter as the base was pretty crumbly during cutting. I think it all depends on what kinda biscuits you are using. However, being the health-conscious me, I used 130g of butter only and somebody who has absolutely zero knowledge in baking told me I used way too much butter. Surprise myself but I listened and used even less (mistake here!). I'd say the perfect amount of butter to use will be 170g (that's if you are using Arrowroot biscuits of course). 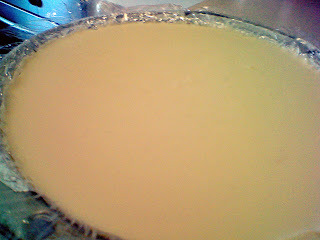 This is what you get after you pour in the creamy durian cheesecake layer. Bring Portion B to dissolve ala Bain-Marie style. Let chill until watm. Beat Portion A until smooth and creamy. Fold in the durian flesh and beat again till even. 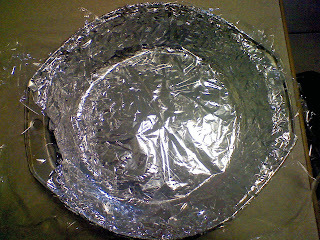 Fold in warm Portion B. Beat until a smooth texture is obtained and combine in Portion C.
Lastly, pour the cream in and whip the batter for a while until smooth and creamy. Chill it in the fridge overnight to let the durian infused the cheese (I think this step makes a lot of difference, be patient and leave it as it is overnight). The next day, make the chocolate topping. Mix Portion D together ala Bain-Marie and chill to room temperature. I pour it over the cake while it was still warm because it starts thickening quickly (temperature today was pretty low, like 14°C). So, I pour half the chocolate fudge on the cake and come to realize that was too little to cover the whole cake. I then proceed to make the other half and when I pour it over, the first half layer on the cake already started to set and harden (sigh!). No matter how I brush it around to coat, it just will not. Hence, I spread it on and around like spreading buttercream frosting. Then drizzle some white chocolates on it and run a skewer around to cover up the ugliness (not really ugly, I still get shiny layer but it was just very bumpy and uneven). Does it look better now? Yeah I know, shivering hands, I just drizzled them on nonuniformly. 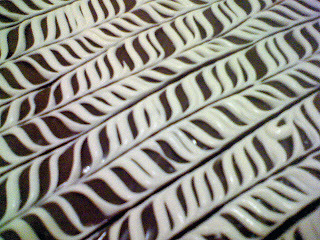 An upclose shot of the surface of the cake. It looks pretty good for me....just a lil' uneven, the lines. The cross section of the cake. You could see the biscuit base was a little brittle. I like the thick biscuit base. Unlike other cheesecake recipe commonly calling for 125g of biscuits only, this one doubles it and eating every mouthful together with the chocolate fudge and the biscuit layer contras back the heavy and filling durian layer. All in all, this was my first try and I'd say I was rather impressed to see how that combination work out to be so well liked. With people asking for more, I really couldn't be anymore flattered. Give it a try if you are a durian lover just like me! 2 comments on "Durian Cheesecake With Chocolate Fudge Topping"